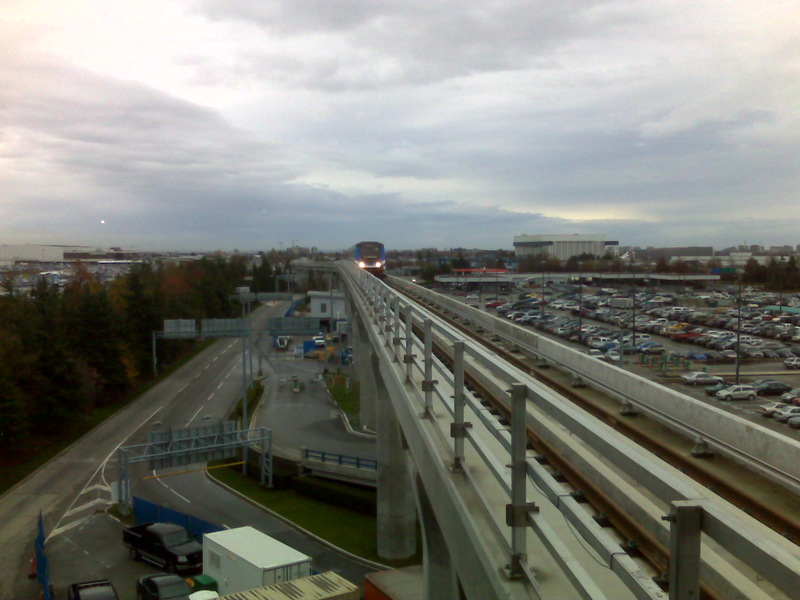 The Canada Line train approaches Vancouver International Airport Station. The Canada Line took its first passengers on a trial run from Bridgeport Station to YVR this morning! I wasn’t there, but those on board included Premier Gordon Campbell, the Honourable James Moore (federal Minister of Canadian Heritage and Official Languages, there on behalf of John Baird, Canada’s Transport and Infrastructure Minister), as well as Kevin Falcon, provincial Transportation and Infrastructure Minister, TransLink CEO Tom Prendergast, many more MPs and MLAs from the Vancouver region, and a number of members of the media. As promised in the November Buzzer, here are all the details for the Name the New SeaBus contest! Edit: Sadly enough, employees of TransLink, its subsidiaries, related companies, transit service contractors and the household members of any of the above are not eligible to participate in the Contest. You can see the official rules for more information. So what are the names of the other two SeaBuses? Just a reminder that on Remembrance Day tomorrow, all transit services will run on a Sunday/holiday schedule. As well, veterans ride free on all TransLink services on Nov. 11, in recognition of Remembrance Day. The concession applies to Ordinary and Life Members of the Royal Canadian Legion, the Army, Navy and Air Force Veterans and the Korean Veterans Association. Veterans just have to show their membership card to receive free transportation (and sorry, associate members aren’t eligible). All TransLink services—meaning Coast Mountain buses, West Vancouver Blue Bus, SkyTrain, SeaBus, Albion Ferry and Community Shuttles—will also observe a period of silence at the stop they reach closest to 11 a.m. on Remembrance Day. Plus, remember! On a holiday, you only need a single-zone fare to travel in all zones all day. As well, on a Sunday or holiday, those with an adult FareCard, West Coast Express 28-Day Pass, or Annual Employer Transit Pass can take either five children or one adult and four children on transit with them for free. The November Buzzer is out today! 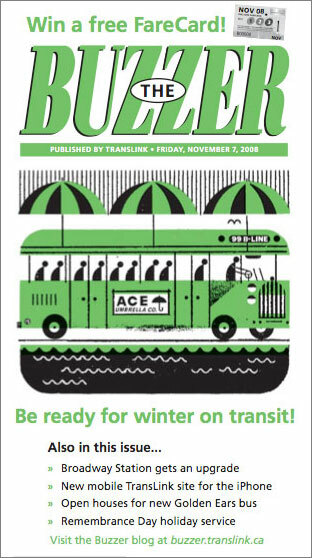 Grab the latest Buzzer on all our buses, SeaBus, SkyTrain, and West Coast Express today! This issue has tips for winter transit travel, an overview of the Broadway SkyTrain changes, GoCard mobile photo locations, and the dates of the Golden Ears Bus open houses. You also might enjoy the Back Issues history item, about cellular payphones that were once installed on the SeaBus! So, enjoy the latest Buzzer! And feel free to let me know in the comments: what stories would you like to see featured in upcoming Buzzers? 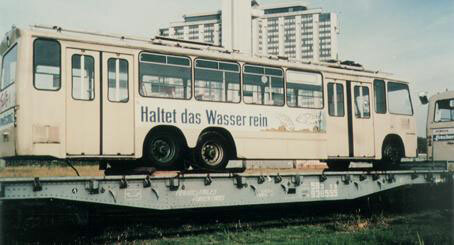 Jorge sent along a photo of a German trolley shipped to Mendoza in 1989. Taken by Osvaldo Manoli, of the Argentinian friends of trams association. So here’s a quick third part to the saga of the retired trolleys. Yesterday, I got an email from Jorge Guevara, from the Mendoza transit agency that bought our retired trolley buses! He promised to send pictures when our trolley buses arrive, and also sent me a few photos of the trolleys in Mendoza, which he said I could share with all of you. Everyone: we’ve dropped registration for comments on the blog! Why? Because lots of people were having trouble writing comments on blog posts, and we wanted people to be able to communicate with us easily. So, goodbye registration. Now all you have to do is write in your name and e-mail address to comment on any post. But we still want you to follow our participation guidelines when commenting here, and we’ve placed a link to the guidelines above the comment entry area to remind you of that. So with that in mind, comment away! And feel free to send me an e-mail if the comment system still isn’t working properly for you. Edit: If you’ve already created an account, feel free to continue using it if you like. Just login here: http://buzzer.translink.ca/wp-login.php. Edit 2: We have removed all existing subscribers from the database to deal with a weird commenting issue described in the comments below. So, unfortunately, it means you can’t log in with your old accounts anymore. Trolleys being loaded into the cargo hold of the vessel Wisdom. Photo courtesy CTL Westrans Shipbrokers. I’ve received some more info and a few more photos of our retired trolleys being shipped to their new home in Mendoza, Argentina, so here’s an update to my earlier post on the trolleys setting sail. CTL Westrans Shipbrokers, the shipping company sending the trolleys on their way, told us that the motor vessel Wisdom completed loading and lashing operations for all 80 trolleys on Tuesday Nov. 4, and sailed from Fraser Surrey Docks at 1600 hrs (4 p.m.). The buses will then be offloaded in San Antonio, Chile, and their estimated arrival date in Chile is Thursday Nov. 27, if all goes well and the weather is good. CTL also sent along some pictures of the trolleys in the cargo hold, and you can see one of them above. For safety reasons, the TransLink staff and photographers weren’t allowed to go up on the ship, so these are probably the only views of the trolleys inside the ship that you’ll probably see! TransLink CEO Tom Prendergast gave a speech at the Vancouver Board of Trade this morning, discussing our long-term strategies and the challenges we’re facing as our transportation network grows. So, I thought I’d take this opportunity to start highlighting the same topics, since we’re actually going to be talking about this a lot over the coming year. It really might sound kind of sleep-inducing, but please don’t let your eyes glaze over! 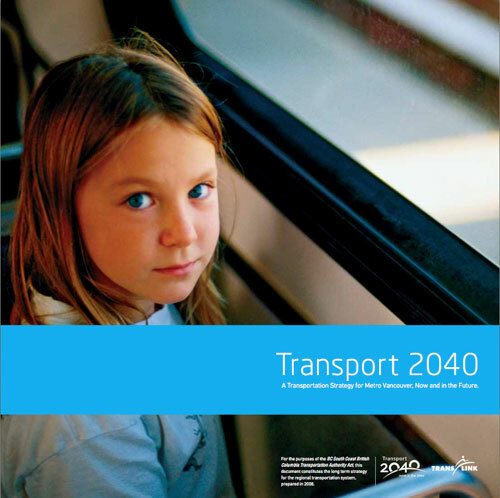 We’re planning the future of transportation in our region here, and we want you to be informed about what we’re doing and where we’re coming from. Poll: do you want service alerts on Twitter? Edit: Garr—the poll doesn’t seem to be working for everybody. We’re working on a solution and the poll itself might have to be restarted in another post. But feel free to leave your comments in the interim! Edit 2: Fixed, yo! We have a new poll up. You might not be able to vote in the U.S. elections today, but you can certainly vote in our Twitter poll! We’re thinking about using Twitter to send out emergency notices for service disruptions. You know: bus cancellations owing to heavy snowfall, or SkyTrain’s at a halt because there’s a fire on the tracks, that kind of thing. Before we jump headlong into tweeting, though, we’d actually like to know whether you would like us to issue these kinds of notices via Twitter. Please vote in the poll below, and feel free to leave a comment if you have anything to add. The poll will be open until 4 p.m. next Wednesday, Nov. 12. Would you like TransLink to start issuing service disruption messages using Twitter? Before you ask, YES, Broadway Station will remain open during the upgrades! And here’s a little more information about exactly what renovations you can expect to see at the station, and how the project came about. 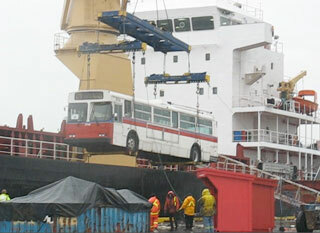 A trolley being hoisted into the cargo hold of a ship bound for South America. We bid a fond farewell to 80 retired trolleys down at the Fraser Surrey Docks this morning. 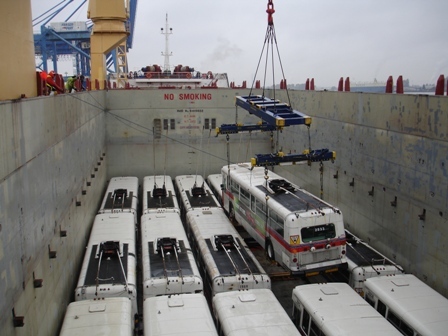 The city of Mendoza, Argentina bought the trolleys from TransLink this year, and the buses were being lifted into the cargo hold of a ship bound for South America. We invited the media and some transit enthusiasts out to watch the trolleys get sent off. It was actually quite sad to see such familiar buses go. “It’s like an angel going up to heaven,” one transit fan even said after we watched them lift this bus away. I took some video and photos of the buses’ departure, and here’s more details on the sale of the buses and the logistics of shipping them to Argentina. Put your costume on and board the SkyTrain for a Halloween party tonight! Seriously: this Friday night, the Vancouver Public Space Network is hosting its second annual Halloween SkyTrain party, complete with a 500MW sound system. All souls should converge in their finest costumes at VCC Clark SkyTrain Station at 8:45pm and wait for instructions. We’ll be leaving promptly at 9:00pm and will be riding the loop into the nether regions of the Lower Mainland before returning to Vancouver. From there, we’ll disembark and hold court with a 100% rain-proof after-party in our newest top-secret public space location. The whole thing will be wrapped up by 11:00pm – leaving you plenty of time to rock out at all the other good parties going on around town. Remember, make sure you’re carrying proof of payment when you’re on the train. The Vancouver Public Space Network also wants to remind everyone to be kind to the train carrying you on the loop, remember to take everything with you when you leave, and to mind your manners and keep the good vibes going—no smoking and no jumping around, especially. Check out the official Halloween SkyTrain party page for more! You know the cherry blossom haiku you see on bus ads in spring? Now’s your chance to get your haiku up there! Just enter the Vancouver Cherry Blossom Festival haiku contest, which is open until on Friday, December 19. Come up with one unpublished English haiku on the theme of cherry blossoms, then visit the festival’s contest website to submit your entry. As always, winning entries will be displayed on bus and SkyTrain ads next spring. The poems will also be read during a Vancouver Symphony Orchestra performance in spring, too! Head on over to the SkyTrain Unconference blog to see the final summary from the unconference. That’s all the discussion info compiled into one delicious Word document! Many suggestions were provided on these points – check out the full post at the unconference blog for the full details. And TransLink and SkyTrain staff are really planning to translate these suggestions into action. We are planning to directly address any issues or suggestions that can be acted upon now, while investigating other issues that need more research and discussion in our organizations, and during future stakeholder consultations on SkyTrain security. Plus, both TransLink and SkyTrain are planning to report back to participants on how we have responded to each suggestion, so stay tuned to the unconference blog and the Buzzer blog for updates!